The fleet's new flagship whose name (Italian for "tiara") says it all. 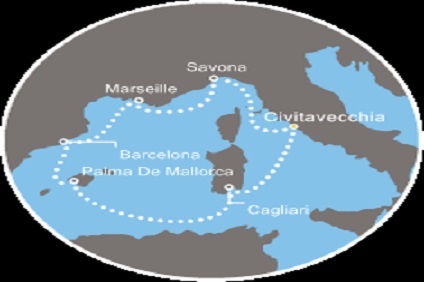 Costa Diadema offers the most complete, innovative and surprising experiences you could have on a cruise. Enchanting you with its many different styles, all coexisting in harmony. Surrounding you with the majestic and refined elegance of its different environments and atmospheres. 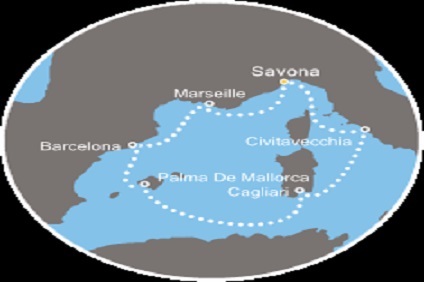 Captivating you with a wide range of attractions for you to experience, from an endless selection of food, with flavours from around the world for you to enjoy, to the most spectacular Samsara Spa in the entire fleet, for maximum pleasure and well-being. 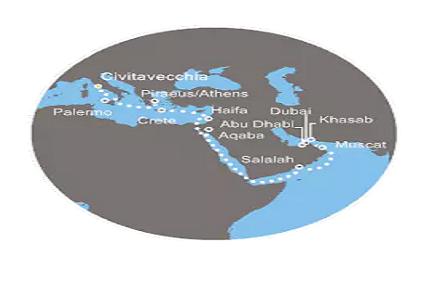 20 Night Cruise sailing from Savona to Dubai aboard Costa Diadema. 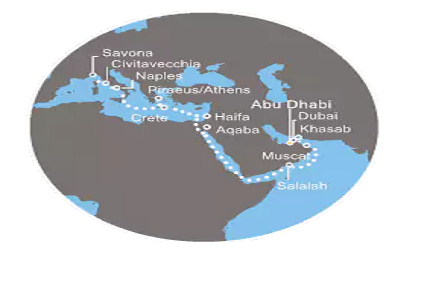 21 Night Cruise sailing from Savona to Dubai aboard Costa Diadema. 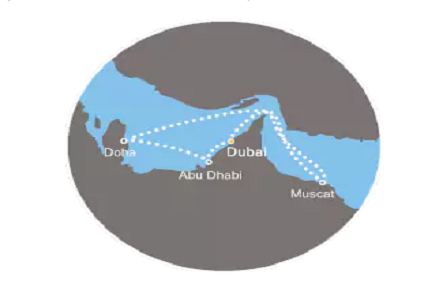 7 Night Cruise sailing from Dubai to Abu Dhabi aboard Costa Diadema. 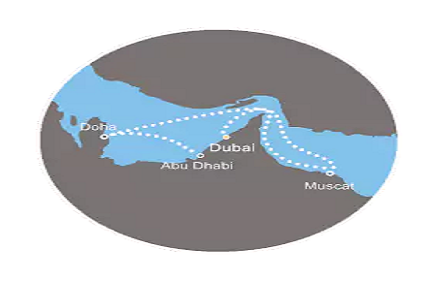 7 Night Cruise sailing from Dubai roundtrip aboard Costa Diadema. 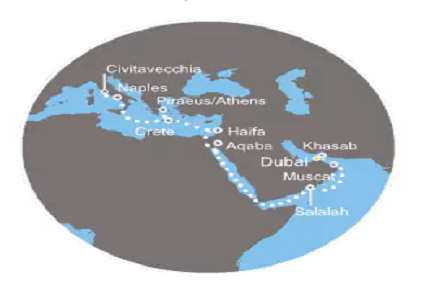 21 Night Cruise sailing from Dubai to Rome aboard Costa Diadema. 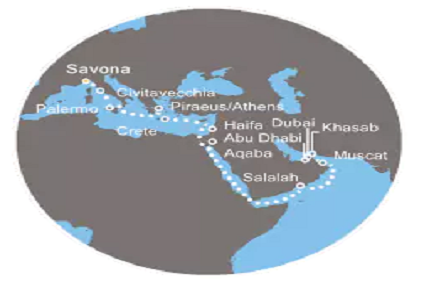 22 Night Cruise sailing from Dubai to Savona aboard Costa Diadema. - Two twins that convert to queen-size in master bedroom - large panoramic windows with glass doors - private veranda - closet - private bath with whirlpool tub and shower - separate seating area - lounge furniture - sofa bed - vanity - television - phone - hairdryer - mini bar - safe. 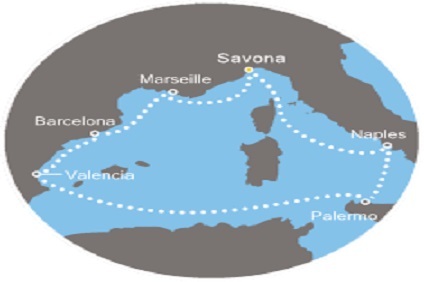 Amenities include in-suite meal service, sparkling wine, cold canapes, daily fresh fruit basket, VIP treatment with priority check-in and disembarkation, packing and unpacking assistance, upgraded bath products, VIP invitation to cocktail party, complimentary dinner for two in specialty restaurant, complimentary continental breakfast, 24 hour room service. Avg sq ft cabin: 456 Cabin size includes balcony. - Two twins that convert to queen-size - large panoramic windows with glass doors - private veranda - closet space - private bath with whirlpool tub and shower - expanded seating area - desk - sofa bed - vanity - television - phone - hairdryer - mini bar - safe Amenities include in-suite meal service, sparkling wine, cold canapes, daily fresh fruit basket, VIP treatment with priority check-in and disembarkation, packing and unpacking assistance, upgraded bath products, VIP invitation to cocktail party, complimentary dinner for two in specialty restaurant, complimentary continental breakfast, 24 hour room service. Avg sq ft cabin: 337 Cabin size includes balcony. - Two twins that convert to queen-size - window - closet space - private bath with shower - seating area - desk - sofa bed - vanity - television - phone - hairdryer - mini bar - safe. Amenities include complimentary continental breakfast, 24 hour room service. 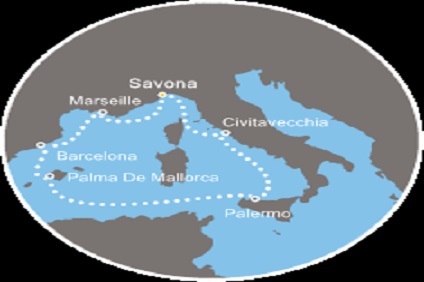 SAMSARA staterooms (Category SO) have unlimited access to Samsara Spa and Thalassotheraphy pool, two complimentary treatments, extra bath amenities. Avg sq ft cabin: 191 Category SO is 225 square feet. Category 12 is 175 square feet. - Two twins that convert to queen-size - window - closet space - private bath with shower - seating area - desk - sofa bed - vanity - television - phone - hairdryer - mini bar - safe. Amenities include complimentary continental breakfast, 24 hour room service. Avg sq ft cabin: 191 Category SO is 225 square feet. Category 12 is 175 square feet. - Two twins that convert to queen-size - closet space - private bath with shower - seating area - desk - sofa bed - vanity - television - phone - hairdryer - mini bar - safe. Amenities include complimentary continental breakfast, 24 hour room service. SAMSARA staterooms (Category SI) have unlimited access to Samsara Spa and Thalassotheraphy pool, two complimentary treatments, extra bath amenities. Avg sq ft cabin: 150 Some inside cabins are 130 square feet. - Two twins that convert to queen-size - closet space - private bath with shower - seating area - desk - sofa bed - vanity - television - phone - hairdryer - mini bar - safe. Amenities include complimentary continental breakfast, 24 hour room service. Avg sq ft cabin: 150 Some inside cabins are 130 square feet.